While the comic is created from an amalgam of different experiences, the horror expressed is real, and I’m sure, quite familiar to some readers. The difficulty here is in gaming with non-gamers. If you’re rolling dice with seasoned meeple-herders, the rules are clear: respect the cardboard. 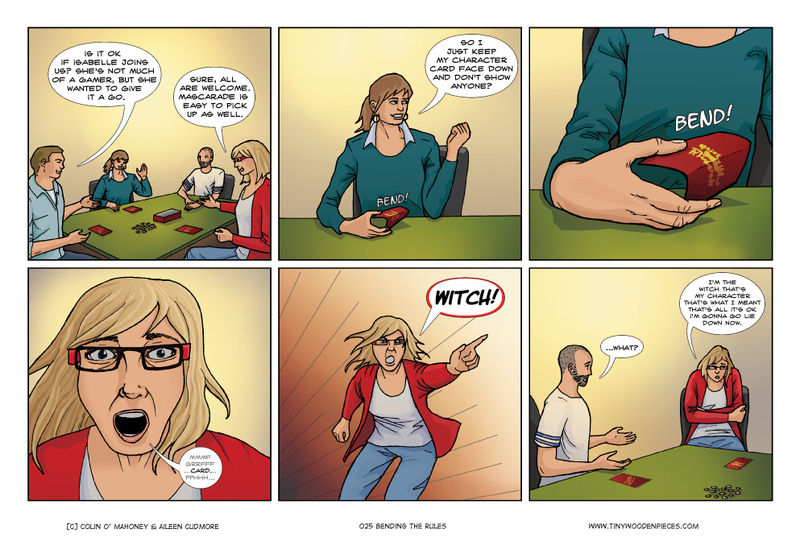 It is more difficult, however, to explain the proper care and attention required when handling a board game to someone previously only familiar with card games involving aces and hearts. A non-gamer simply won’t understand why you turn white at the manner in which they are treating your cards. In fact, they are quite likely to set down their drink heart-stoppingly close to the board in order to ask what the matter is. Our copy of Love Letter bears the marks of such ill-treatment; one of the cards was bent so out of shape that it was obvious where it was in play at all times. Thankfully some emergency sleeve surgery the across the deck was enough to hide the injury, and ensure we, as owners of the game, had no unfair home advantage over guests at our table. Do these risks make us reluctant to share our games with dilettantes? Never. Never ever. Tiny Wooden Pieces was founded on the idea that board games are a fun, funny hobby, and they are for everyone. Holding the condition of a game in such a high regard as to inhibit ever opening the box is anathema to what us. Board games are a social experience, and should never be exclusionary. Our copy of Citadels has more wear and tear than an assassin’s dagger (how many gold in one turn? Take that merchant.) That’s the nature of the game, though. It gets played with friends and family as much as with ‘gamers’. It’s great while travelling, and it’s easy to teach to people. Citadels was an early purchase for us, and is one of our most-played games. If Citadels ever does get sleeved, it will likely be to simply keep it from falling apart. The ship has long since sailed on keeping the game in mint condition. But that little blue box holds as many memories as it does cards and we’re happy to have it that way. We are not, however, anti-sleeving. Our own collection is a mix of sleeved and au natural. If you don’t want to sleeve, sure. Don’t sleeve. But being actively anti-sleeving seems a little more extreme than the discussion merits. It is a bit of a heart-stopping moment, when you first realise a card has been bent. There’s no going back, it can’t be undone. And it can be genuinely upsetting if a beautiful board game component is irrevocably tarnished. But, I would never actually react like that in the comic. No-one intentionally sets out to destroy a card, even little kids. Personally, I believe that it’s just something that can happen when a game is often played. Whenever any object is handled by several different people, wear and tear will inevitably occur. As a child, I loved playing games with the standard 52 card deck – everything from good ol’ solitaire to forty-fives and numerous things in between. But I didn’t stop there. I must admit that I actually collected decks of cards. Mostly they were picked up as souvenirs from holidays and only the difference between them were the images on the back. But one of my all-time favourite decks was one that had a picture of all the past kings and queens of England on the actual playing surface. See, I got to play a game and learned a bit of history! So this much-loved deck saw a lot of playing time, and it eventually showed. Gradually, all the cards became quite worn and frayed. But I didn’t really mind because, for me, that just proved how much I loved using them. I could still play with them, and now they had their very own history, intertwined with my own. So if I see a card that looks like it’s a bit roughened, it just reminds me that it was once played with. And someone probably had a good time while doing so. And at the end of it all, isn’t that the most important thing? I’m a little OCD about our card games. I much prefer to spend the additional 10 or 20 bucks and get sleeves so the game stays in good condition. But my OCD would never prevent me from sharing the game with others. I completely agree that board games are about having fun. I love introducing others to it and sharing in their experiences. Actually, despite all that I said (and reminiscing about childhood hobbies), if I did have that little extra bit of money to spare, I probably would want to sleeve ALL of our card games. Just to be sure, you see. But at the moment, for me, it’s just more important to save up for the next new game… but I guess that’s going to be an ongoing dilemma! Thanks so much, we’re so glad that you enjoyed it! Great comics! Keep up the awesome work. I once played TtR with my wife’s work friends, and one of them put his beer ON the board. ON THE BOARD!